The Fischer–Tropsch process (or Fischer–Tropsch Synthesis or F-T) is a set of chemical reactions that changes a mixture of carbon monoxide gas and hydrogen gas into liquid hydrocarbons (like gasoline or kerosene). The Fischer–Tropsch process involves many kinds of reactions, which lead to both wanted and unwanted results. The desirable reactions create chemicals called alkanes. Sometimes the gas methane (natural gas) is produced, which is generally undesirable. Sometimes, different kinds of alcohol are produced in small amounts. Many steps are required to make the gases needed for the F-T process. For example, all chemicals entering the reactor must have all sulfur removed. For factories that start out with methane and want to make a liquid hydrocarbon (like kerosene), another important reaction is "steam reforming", which turns the methane into CO (carbon monoxide) and H2 (hydrogen gas). This is the chemical equation for how steam reforming works. The reaction above describes one molecule of H2O (steam) plus one molecule of CH4 (methane) converts into one molecule of CO (carbon monoxide) and three molecules of H2 (hydrogen gas). A catalyst is a substance added to change the rate of a chemical reaction, generally to make it faster. Many different catalysts can be used for the Fischer–Tropsch process. The most common catalysts are the metals cobalt, iron, and ruthenium. These metals are all transition metals. The metal nickel can also be used, but generally with unwanted results. A nickel catalyst in the reaction usually produces a lot of methane, which is undesirable. Cobalt seems to be the most active catalyst (it has the greatest and fastest effect on the process). When the input is a natural gas, cobalt catalysts are very good for the Fischer-Tropsch process. Iron catalysts are better when the input gas is of lower quality (less pure) such as coal or biomass. Most metals used for this process (like cobalt, nickel, and ruthenium) remain in their metal form when added to the process. However, iron catalysts behave very differently. Often, iron catalysts change form and chemical phase, like converting into various oxides and carbides during the reaction. It is important to control all of the iron reactions during the process, or else the process may not work correctly. Fischer-Tropsch catalysts are famous for being extremely sensitive to the addition of sulfur. Even a tiny amount of sulfur can have an undesirable impact on the reaction. Cobalt catalysis is more sensitive to sulfur than iron. High-Temperature Fischer-Tropsch (or HTFT) is performed at temperatures of 330°C-350°C. HTFT uses an iron-based catalyst. Sasol used HTFT in Coal-to-Liquid plants (CTL). Low-Temperature Fischer-Tropsch (LTFT) is performed at lower temperatures and uses a cobalt-based catalyst. Shell used LTFT in an integrated Gas-to-Liquid (GTL) plant in Bintulu, Malaysia. Some F-T factories use coal, biomass or other solid compounds as a starting point. Before these factories can begin the F-T process, they must turn the solids into gases such as CO, H2, and alkanes. Changing solid chemical compounds into gas is called gasification. The gas collected from coal gasification often has a CO/H2 ratio of ~0.7 instead of the optimal ratio of ~2. This ratio can be adjusted from 0.7 to 2.0 using the water-gas shift reaction. Gasification is a dirty and expensive process. Coal-based Fischer–Tropsch factories start out with coal, gasify the coal, and then use the resulting gas as feed stock for the Fischer-Tropsch process. These factories can produce large volumes of CO2 in this way. One of the main reasons for this approach is the large amounts of energy required for a coal-based gasification process. The original process was invented by Franz Fischer and Hans Tropsch while working at the Kaiser Wilhelm Institute in the 1920s. Since then, many improvements have been made. The term "Fischer-Tropsch" now is used for many similar processes. Fischer and Tropsch submitted several patents, like US patent no. 1,746,464, applied for in 1926, and published in 1930. It was given to the factories in Germany in 1936. Germany had an abundance of coal but very little petroleum. The F-T process enables the conversion of coal into gasoline, which is important for gasoline-based transport like cars, airplanes, and trucks. As a result, during World War II, the F-T process enabled Nazi Germany and Japan to produce substitute fuels for tanks and cars. F-T fuel production made up about 9% of German wartime fuel production and 25% of the automobile fuel. The United States Bureau of Mines ran a program started by the Synthetic Liquid Fuels Act. The Bureau hired seven fuel scientists from Operation Paperclip to work in a Fischer-Tropsch plant in Louisiana, Missouri in 1946. Operation Paperclip was a project to recruit German scientists to work for the US after World War II. The F-T process has been used by many large companies, however the process is unpopular for many reasons. F-T factory equipment is expensive, and has high operating and maintenance costs. Also, petroleum, which competes with F-T products, has very unpredictable prices. Usually, factories are only profitable when they have access to "stranded gas". "Stranded gas" is the name for sources of natural gas very far from major cities that are too expensive to pump to consumers. If the natural gas could be pumped to these cities and sold directly to consumers, it would be much more profitable. Therefore, several companies are developing processes to enable practical exploitation of so-called stranded gas reserves. The largest F-T factories with the largest application of F-T technology are owned and operated by the company Sasol in South Africa. South Africa is a country with large coal reserves but not enough oil to meet demand. Germany is in a similar situation. Sasol employs coal and natural gas in the F-T Process. They produce many different substitutes for oil products, and produce most of the country's diesel fuel. One of the largest uses of F-T technology is in Bintulu, Malaysia. This Shell factory turns natural gas into low-sulfur diesel fuels and food-grade wax. They produce approximately 12,000 barrels/day. 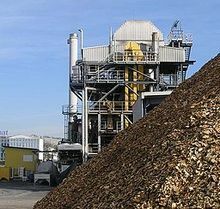 In October 2006, Finnish paper and pulp manufacturer UPM announced its plans to produce biodiesel using the Fischer–Tropsch process. It said that it will do this along with the manufacturing processes at its European paper and pulp plants. It will use waste biomass from paper and pulp manufacturing as raw material for biodiesel. In 2009, chemists working for the U.S. Navy studied Fischer-Tropsch for making fuels with hydrogen from electrolyzed seawater. With the usually optimal cobalt catalyst, this study produced mostly methane gas. Use of an iron catalyst, however, resulted in only 30% methane in the product; the rest consisted of short-chain hydrocarbons. Further refining of the hydrocarbons produced could lead to the creation of kerosene-based jet fuel. The abundance of CO2 makes seawater look like a good alternative fuel source. Scientists at the U.S. Naval Research Laboratory said that, "although the gas forms only a small proportion of air – around 0.04 per cent – ocean water contains about 140 times that concentration". ↑ "US Fuel Supply Statistics Chart". ↑ Oliver R. Inderwildi, Stephen J. Jenkins, David A. King (2008). "Mechanistic Studies of Hydrocarbon Combustion and Synthesis on Noble Metals". Angewandte Chemie International Edition 47 (28): 5253–5. doi:10.1002/anie.200800685. PMID 18528839. ↑ "German Synthetic Fuels Scientist". ↑ 10.0 10.1 Kleiner, Kurt (18 August 2009). "How to turn seawater into jet fuel". New Scientist. https://www.newscientist.com/article/dn17632-how-to-turn-seawater-into-jet-fuel.html. Retrieved 2009-08-20.